The Federal Reserve announced Wednesday that it will begin scaling back its the purchase of bonds and mortgage-backed securities to $75 billion a month beginning in January. The move came as a surprise to some Fed watchers who thought the Central Bank might hold off on tapering until this spring as the economy gathers strength. However, the Fed had been warning for months that it would soon need to reduce its role in the economy. The Fed was purchasing $85 billion a month in bonds in efforts to spur economic growth. Outlining the reduction, Fed Chair Ben Bernanke said that monthly bond purchases will be reduced by $10 billion a month with fewer purchases of Treasury bonds — $40 billion down from $45 billion a month — and mortgage-backed securities — $35 billion rather than $40 billion. In attempts to promote borrowing and spending during the recession, the Federal Reserve began purchasing large-scale asset packages in December 2008, known as quantitative easing (QE), in order to drive long-term interest rates lower. The Fed is currently in its third round of QE. As debates continue on scaling back on the economic stimulus, the Fed said further steps in reducing its purchases could be in the future if improvement continues. The Dow and S&P closed at record highs following the announcement. However, the Fed also plans to continue to keep holding interest rates near zero for the foreseeable future since inflation remains low. In fact, even if the unemployment rate drops below 6.5 percent by the end of next year — a target the Fed had named before — it will hold interest rates near that level so long as inflation remains low in order to continue to spur the economy. 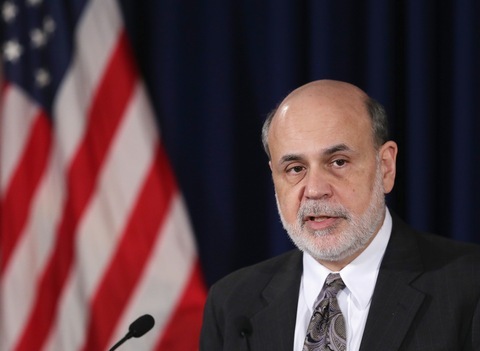 Throughout the press conference, Bernanke emphasized that the Fed was seeking a careful balance. One the one hand, don’t withdraw support too quickly or dramatically from an economy that’s gaining strength but is still weak compared to past ones. On the other, he noted it was time to start pulling back moderately at the size and scope of the Fed’s role. Asked about his future successor, Fed Chair Nominee Janet Yellen, Bernanke said she agreed with the move.